This is a wonderful alternative to cake - and quite fun to serve to people who think it is a cake, until you cut inside, and reveal it is actually watermelon! I got the idea from something I saw on a Slimming World Facebook page; if you left off the nuts around the outside the whole thing would be completely syn free. All you need is a watermelon, a tub of Quark, sweetener (optional), flaked almonds or chopped mixed nuts (optional) and any fruit you like to decorate the top. I've had a bit of an obsession with watermelon recently, as regular readers will notice! Slice the top and bottom off the watermelon so it will sit flat and then use a sharp knife to remove the rind by cutting down from the top, turning it over and doing the same from the other side. Mix the tub of Quark with a little sweetener (such as Splenda) if desired. Pat dry the watermelon with some kitchen towel and spread the Quark around the outside and on the top. I've already put it on a cake board at this point. Take handfuls of flaked almonds or chopped mixed nuts and stick around the outside. And here is the finished 'cake'! I took this into work and my colleagues were surprised when they realised what was inside - and I think happy that I made something healthy! This is great for a summer party when it is too hot to eat cake but you want to make something. 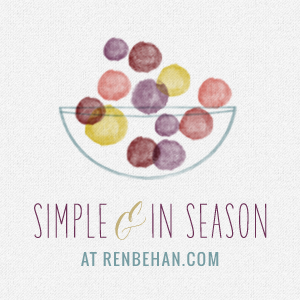 I'm also sending this to Ren Behan's Simple and In Season, hosted this month by Sally at My Custard Pie. Shaheen at Allotment 2 Kitchen is hosting a blog challenge called the Vegetable Palette, and this month is asking for entries using red fruits or vegetables. Watermelons are a kind of reddish pink so that will do! Aren't watermelons so refreshing? ...... But I have never seen one turned into a cake! When I was pregnant I had watermelon cravings and ate a whole one every couple of days. This 'cake' would have been a perfect treat! absolutely stunning!... i'd seen this on pinterest I think and really wanted to have a go and I think you'd done a beautiful job. I can't wait ti give it a go! Thank you so much for entering Simple and in Season. Such a unique idea and a lovely addition to the round up which is now published.